So you’re thinking about heading to Italy? It is one of our favorite countries and one that we are in the process of obtaining citizenship. Having been a few times, it occurred to me that many people have not had the pleasure of traveling there. 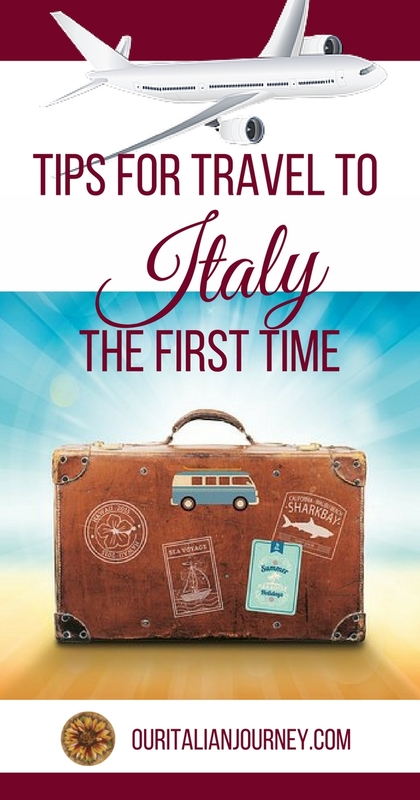 Here are a few items that should make your travel to Italy a bit easier. 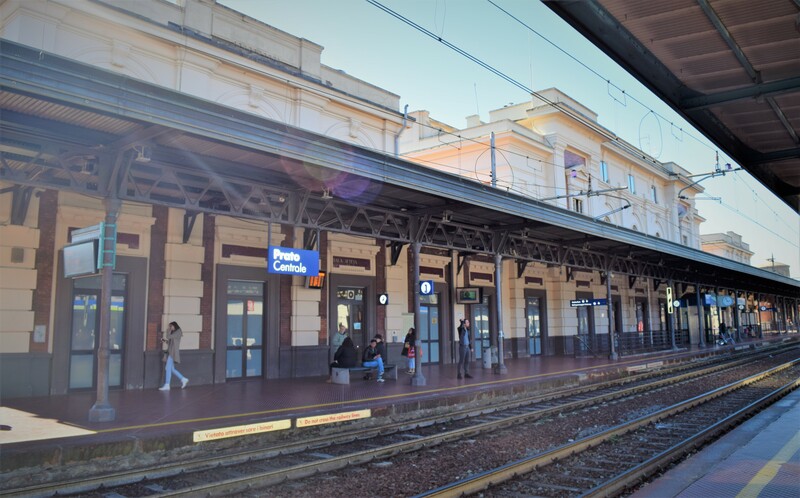 It is always better to be prepared and I assume you are reading this post to familiarize yourself with traveling in Italy. We have many posts on places to visit and things to do on the blog. Hope you stay a while and check some of them out. This is your best bet for travel between cities. The Regional trains stop at major cities. The Local trains usually stop at every single station along the route. There is also the Intercity which is the fast trains and is a bit expensive but might be worth it depending on your time. Purchasing tickets online sometimes guarantees extra promotions and/or discounts. Also, check out traveling on Saturdays as most the time you can get a 2/1 ticket but you have to purchase the ticket several days prior to departure. There are different classes when you purchase a train ticket. The difference between First and Second class is that in First class you always have an assigned seat. We have traveled more in Second class as it is cheaper and finding a seat has not generally been an issue. If the train is pretty booked, you might consider getting an assigned seat. The people at the train ticket counters are generally really nice and work through language barriers very well. You must remember to validate your ticket prior to getting on any train. Fines will occur if the conductor catches that your ticket was not validated in the machine before you got on the train. A recent post of ours goes into detail. Traveling by taxi is a bit expensive in Italy. At times, of course, this can’t be avoided. Make sure you take only official taxis which have the license number clearly displayed and they all have a TAXI sign on the roof. It is wise to get the taxi at one of the Taxi stands or make the reservation by phone. If traveling some distance, ask the driver’s cost estimate for your route in advance so there are no surprises. Bus tickets must be purchased before you get onboard. You can purchase bus tickets at kiosks and at Tabacchi shops. You also, like train tickets, must validate this ticket! All ATM machines are called BANCOMAT. Credits cards with a Pin number are accepted at these machines. You should notify your credit card company before you leave that you will be traveling. Also find out what the amount is you are allowed to withdraw each day. If you need to use a bank, they are usually open from approximately 8:30 am – 1:30 pm and 2:30 – 3:30 pm and are closed on weekends. Major credit cards are generally accepted throughout Italy. If you are a US Citizen, remember that Discover Card is not accepted in Europe. Many credit card companies charge a fee for foreign exchange transactions. We use Charles Schwab Bank and they reimburse ALL foreign fees. We truly like this company. Here are some important phone numbers to keep handy when traveling in Italy. When calling the United States, dial 001+area code+ phone number. When we get off the plane, we head over to one of Italy’s cell companies. We get a basic plan for our cell phones. To date, we have used TIM but there are plenty of companies available. We actually might try a different one next time. We then use SKYPE for calling back in the US and WHAT’S APP (app) for texting friends and family. Of course, if you have an iPhone, you would have Facetime and not Skype. You can purchase stamps (Francobolli) at the Post Office and at Tobacco shops (Tabaccheria). Hours for the post office are generally 8:30 am – 2:00 pm daily and close at 12:00 pm on Saturday. This is us! 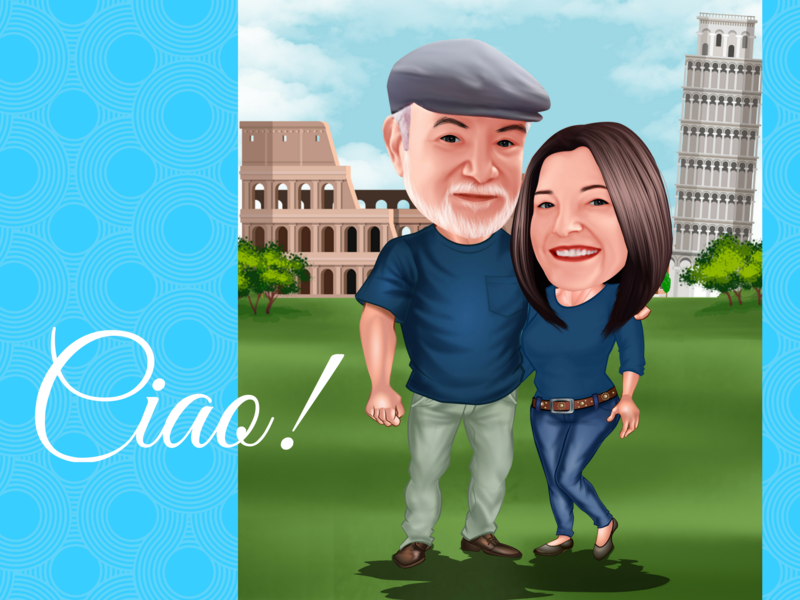 We had our caricature done by one of the freelance artists on Fiverr. LOVE this site and prices are so reasonable! Actually having another one done now! Click below and see what an artist can do with one of your photos! Excepting some cases, bathroom use is free in bars and restaurants if you are there as a customer. In almost all cases, you are not permitted to use a restroom at a restaurant or bar if you are not eating/drinking there. Sometimes it is worth it just to purchase a coffee to use the restroom if you have no other option. Railway and bus stations often require coins for payment to use the restroom.